Most Europeans who came to Virginia in the 1600s, and many who came to Québec, were indentured servants, or engagés. These were new, temporary forms of servitude designed to fund passage of immigrants to the New World. In Québec, farmers on seigneuries were not simply tenants; they were required to perform a variety of manorial duties. In New Mexico, the encomienda system granted elite Spanish settlers far greater rights in the labor of Pueblo villagers, but the Pueblos retained crucial legal rights. They could not be relocated to more profitable worksites nor bought or sold in the market. 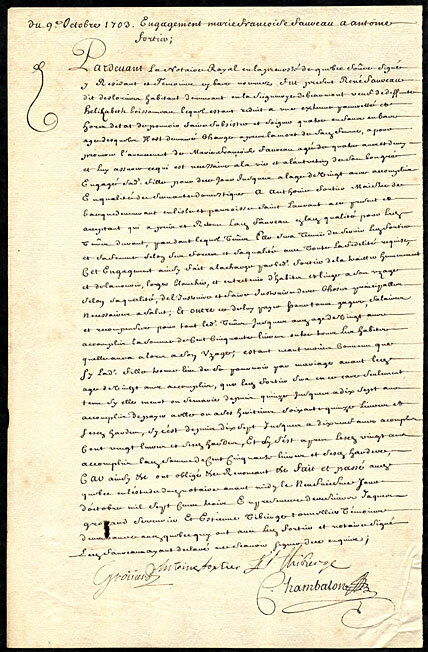 By this contract, a four-year-old girl became a servant in Quebec in 1703. In part it reads, “Reduced to extreme poverty and the father of four young children, René Favreau, a resident of the domain of Beaumont, engages his four year old daughter, Marie Francoise, for her advancement, as a servant to Antoine Fortier.” Reproduction. Some Native American peoples took captives in warfare to serve as slaves, but those individuals might later become free members of the society of their captors. In Québec, the French system of alliances sometimes required them to buy captives taken by their allies from enemy tribes. At Santa Fe, the crown officially forbade enslavement of indigenous people, but many settlers ignored the law. Some sold Apaches, Utes, and other peoples taken captive in war to mineowners far to the south in New Spain. Chattel slavery-the kind imposed on Africans who were brought to the Americas-developed as Europe expanded into the New World. Chattel slaves served for life, could be bought and sold in the market, and had their children inherit the status of slaves. Virginians adopted this form gradually, enacting legal slave codes in the 1660s. 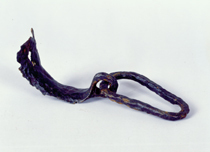 This shackle found at Jamestown could have been used during the colony’s early years of martial law or later in the slave trade. Africans did not outnumber English indentured laborers in Virginia until the 1700s.